Mom: Why is it so dark out? Me: Well, it's 9:30 so it's supposed to be dark. Mom: How long is it gonna be like this? Me: The sun comes up about 7 so I guess that's about 10 hours. Me: Why don't you think about going to bed? Your mom is pretty lucky to have you as a son. Only two years? 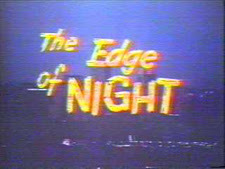 It was my mothers favorite show, thus I grew up on Edge Of Night. I know, it explains a lot.